The mostly dull theme park attraction which opened Wednesday at the Broward Center for the Performing Arts in Ft. Lauderdale isn’t without merit. Diana Huey, who plays the lead role of mermaid Ariel in the second-rate attraction (sorry, musical) “Disney’s The Little Mermaid,” can sing pleasantly, powerfully and clearly. She can also hold a note for more seconds than you’d want to hold your breath under water – a feat that elicited enthusiastic applause from audience members attending opening night of the touring production of The (Seattle) 5th Avenue Theatre’s staging of the Broadway musical here in South Florida. This tedious production features overacting and lyrics which are sometimes hard to understand, thanks to an overpowering orchestra. The production is anchored at the Broward Center through March 5. This rendition has been billed as an “all-new staging” of the musical, based on the classic 1989 animated film. The movie, in turn, is based on legendary storyteller Hans Christian Andersen’s tale -- about as dark as the film is bright and cheery. In this “all new staging,” the cast tries to charm and be funny. However, it’s hard to receive laughs when it appears you’re, well, fishing for them. In comedy, you’ve got to earn laughter by being true to the material. That’s not something Melvin Abston, who plays the Jamaican crab Sebastian, seems to realize. Abston constantly tries to draw attention to himself. If Abston is trying to be noticed, he has competition in the form of an odd mixture of purple, green and blue lighting, designed by Charlie Morrison that gave you the feeling that the “water” on stage was contaminated with some unsightly and harmful chemical or algae. It gives Ariel a whole new reason to want to escape her underwater existence. Other than the lighting, the only other production element that seems to suggest the presence of water is a cluster of what resembles small blue balloons, which randomly appear and disappear. At least Paul Rubin, who is in charge of the flying sequences, could’ve worked with lighting designer Morrison to ensure that the ropes attached to the backs of the actors aren’t so visible. Children will no doubt admire the visual elements. 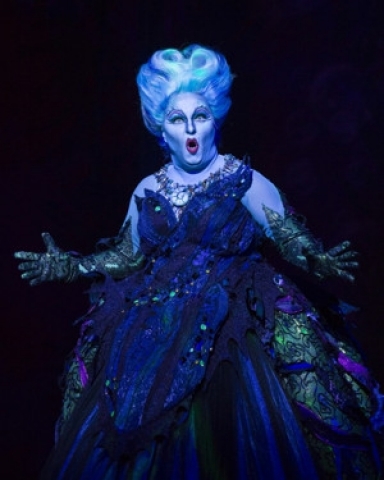 They’ll also likely boo at the witch Ursula, played with a sly and evil disposition by Broadway actress Jennifer Allen. But between the costumes, overdone lighting and a green haze on stage, what gets lost is the touching, compelling story of Ariel’s burning desire to live “where the people are,” become human and win over Prince Eric before it’s too late. Judging from Matthew Kacergis’ portrayal of the prince, it’s hard to fathom why Ariel is so enamored of him. Kacergis’ Prince Eric lacks the dreamy-eyed, charming quality that makes the character so appealing in the film. Here, the prince is bereft of much of a personality, appearing strangely aloof. Furthermore, Kacergis is short on chemistry with Huey’s Ariel. Huey tries hard to endow Ariel with a dreamy, yearning aura. She’s successful at times, but during others, she brings to mind London Tipton, a scatterbrained, rich and spoiled young woman in TV’s “The Suite Life of Zack & Cody,” a sitcom which ran from 2005-2008. Steve Blanchard is commanding as King Triton, Ariel’s stern father who forbids her from leaving her underwater existence. He also finds the father’s softer side during appropriate moments, imbuing him with human qualities. The musical is mostly faithful to the film and such delicately beautiful songs as “Part of Your World” remain. It is solidly sung by Huey. Unfortunately, it was hard to hear the lyrics of “The World Above,” which sets the tone at the beginning by having Ariel sing about how she feels above water. The number “She’s in Love” is a loud, repetitive and annoying song that adds nothing to the script. The song is joined by others with forgettable melodies and pedestrian lyrics. “Under the Sea" is half-heartedly sung by Abston. The Caribbean flavor to the song is accounted for, but it lacks the energy of what should be a showstopper. There are too many shortcomings in this production for it to earn the right to be part of the “Bank of America Broadway in Ft. Lauderdale” series. This is not Broadway quality musical theater.